The development and education of our nursing students is a key component of the Nursing Department. We value the opportunity to contribute to your growth as a nurse through clinical placements and working along side our outstanding staff. We believe today’s academic health science environments must focus on advancing nursing within the domains of practice, education, research and leadership. Our intent is to provide you with a meaningful and professional clinical placement, and to help you become the best nurse you can be. Are you interested in a student placement? Contact your school for your school’s specific processes for confirming clinical placements. 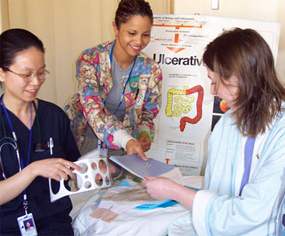 General questions about nursing clinical placements at Mount Sinai? Please contact Student.MSH@sinaihealthsystem.ca.